Vikas Swarup's spectacular debut novel opens in a jail cell in Mumbai, India, where Ram Mohammad Thomas is being held after correctly answering all twelve questions on India's biggest quiz show, "Who Will Win a Billion?" It is hard to believe that a poor orphan who has never read a newspaper or gone to school could win such a contest. But through a series of exhilarating tales Ram explains to his lawyer how episodes in his life gave him the answer to each question. Ram takes us on an amazing review of his own history -- from the day he was found as a baby in the clothes donation box of a Delhi church to his employment by a faded Bollywood star to his adventure with a security-crazed Australian army colonel to his career as an overly creative tour guide at the Taj Mahal. Swarup's "Q & A" is a beguiling blend of high comedy, drama, and romance that reveals how we know what we know -- not just about trivia, but about life itself. 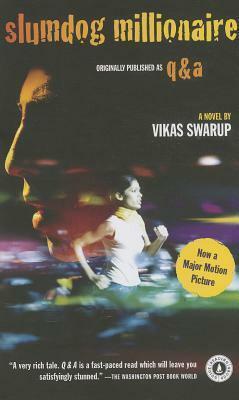 Cutting across humanity in all its squalor and glory, Vikas Swarup presents a kaleidoscopic vision of the struggle between good and evil -- and what happens when one boy has no other choice in life but to survive.